Having two dogs off leash in the city can be distracting with keeping track of each one. Having learned from the previous post that Sugi benefits from being leashed to Tom, we tried out a new walking technique. We leashed Tom and Sugi together for our morning walk. This worked out beautifully! 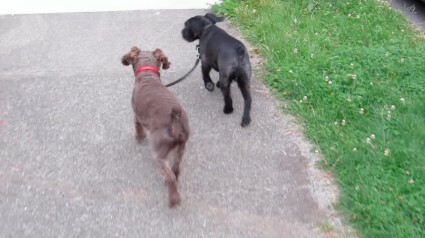 Sugi benefitted from Tom’s desire to stay close to us; Tom benefited from Sugi’s good walking manners. Since then, we have been walking with the dogs in this way and gaining approval from other dog walkers.